Hacking away at the Earth in a mine doesn't typically yield a monumental come-up, but miners in Australia have nonetheless tried their luck and succeeded remarkably. 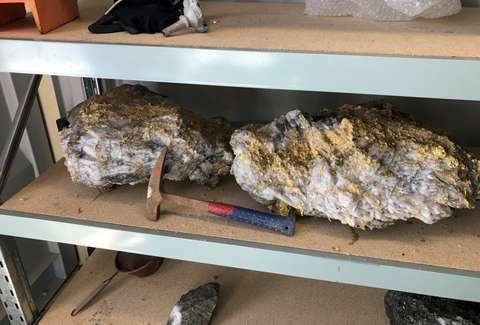 On Sunday, Canadian mining giant RNC Minerals happened upon two gold-laden rocks that look like the stuff of storybook treasure, worth an estimated $13 million. As a result of the momentous discovery, share prices in RNC minerals have skyrocketed. The miner who unearthed the treasure, Henry Dole, marveled at the underground riches he unwittingly stumbled upon. “Never in my life have I seen anything like this. There were chunks of gold in the face, on the ground, truly unique I reckon,” he said, according to ABC. Western Australia's Beta Hunt mine usually plumbs the Earth for nickel, adding to the astonishment of RNC Mineral chief Mark Selby, who woke up to news on Sunday notifying him that he'd just become wealthier: “It was a nickel mine for years and years. But we bought it because there were a bunch of gold deposits sitting beneath it," Selby told Canada's Financial Post. The larger rock extracted from the mine weighs 95-kilograms (210 pounds), riddled with 2,400 ounces of gold, worth an estimated $11 million. The second smaller rock, weighs 63-kilograms (140 pounds) and contains 160 ounces of gold with an estimated $2.6 million. Miners were working 1,600-feet beneath the Earth's surface when the discovery was made. Australia is one of the biggest producers of precious metals and minerals on the planet. Gold, however, only forms about 9% of its reserves composition, according to a 2010 Citi Group report, making the discovery of the two massive, gold-laden crags all the more improbable. RNC Mineral, which was previously exploring a potential sale of the mine, is no longer interested in selling such a valuable resource, given the unexpected boon. And who would do such a thing after unearthing mythical-looking rocks speckled with radiant, almost twinkling gold? Instead, Selby told the BBC that the company plans to auction the rocks off, so the mining corporation can turn its $13 million discovery into presumably many more millions. Sam Blum works at Thrillist right now. Follow him @Blumnessmonster.